single shut off pneumatic coupling | NV Series | BS HYDRO-PNEUMATIC PVT.LTD. B.S.Hydro manufactures single shut off type coupling for pneumatic application. NV series type of pneumatic coupling is designed with blade valve and a captive ball locking arrangement. Modular and Light weight design of NV series makes it ideal for using it in pneumatic tools for frequent connection and disconnection of fluid lines are required. NV series type single shut of quick coupling work on simple Push and Pull principle. 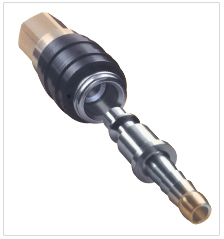 When the Adaptor is pushed to the coupler, it is accurately held by the self locking arrangement resulting in a positive & leak proof connection. 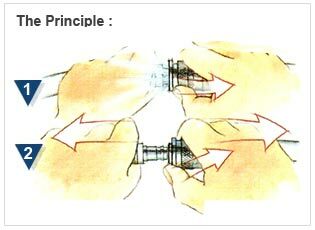 This action simultaneously opens the valve & fluid flow starts. To disconnect, pull back the sleeve of the coupler, the Adaptor ejects out and the valve shut off automatically. The pressurized fluid (air) is vented into the atmosphere via straight thro adaptor. Copyright © B.S Hydro-Pneumatic Private Limited All rights reserved.